For literacy to be a really desirable goal for a young child, it must be endowed by him with magic meaning. Only then will it become attractive to his unconscious, which will consequently support the child’s conscious efforts to master reading. Later, the irrational aspects of literacy can become safely reduced and the rational ones gain ascendancy. But if this divestment of magical connotations occurs too soon and too radically, reading will not be strongly invested emotionally. The work of mystical fancy does not call upon the emotions of the reader merely for the pleasure the child often finds in such reading, but because the author believes that the emotions are essential in helping the child intuitively grasp that kind of knowledge which is unattainable through the ordinary corridors of reason alone. Stories appeal to the child’s normal need for identification, which is a need not for finding others just like himself (the mistake of so much contemporary children’s literature), but for finding others who are better than himself— who are as he might become if he could fulfill his potential for goodness. This is not a book about teaching a child to read; it’s about teaching a child to want to read. For further discussion on the topic, “Why Children Read” see Eugene Schwartz, The Cry for Myth. This entry was posted on Wednesday, October 19th, 2016 at 6:44 am	and is filed under Education. You can follow any responses to this entry through the RSS 2.0 feed. Both comments and pings are currently closed. The boy is motivated to read because reading kindles the spirit. When engaged we become entertained. This is the spark of life long learning. When what one reads fuels the imagination, the hook is set. If the medium is the massage, then in this boy’s case the massage is the vision that ensues from his deliberations. The boy is motivated to read because the story takes him out of his own world and into the stories. The story appeals to the boy’s sense of adventure because of the subjects. The story expands his imagination because he can pretend he’s living in a land of knights and castles. The story gives the boy an escape from the day-to-day doldrums of schoolwork. The story ads to the enjoyment of the boys lunch hour. This boy is motivated to read because his life is enriched as he lives the journey of a brave knight. When this boy reads he is mentally and emotionally transported into a fantasy, but the feelings are real. He lives through the trials and tribulations of the knight who makes strong choices. He also experiences the mistakes of the knight and learns from them. This boy is motivated to read because it expands his mind and subsequently his life. 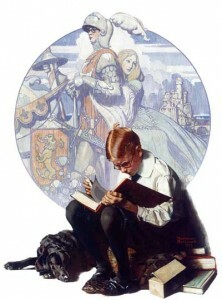 is no longer just an ordinary boy reading a book, but a noble knight in a “Land of Enchantment. Children read to learn new things and to be transported to places where they can enjoy a type of freedom not afforded them in every day real life. In every day life they are always told what to do, how to do it,whythey should do it and when to do it. Reading stories of power struggles between adults and children, for example (Harry Potter books or books by Roald Dahl),appeal to a child’s sense of fairness and goodness in the world. Reading helps them cope with the problems that strong main characters present, thus giving them new ways to examine their own feelings and how they will cope with what life puts before them. The boy is motivated to read because it gives him the opportunity to escape into the world of fantasy. While reading the story he is transformed into a fearless knight in shining armor. His everyday world slips away as he imagines himself joining other knights to do battle with a dragon and save a damsel in distress. Funny how that damsel looks an awful lot like the girl who sits in front of him in English class, the one he’s too shy to speak to in real life. Ah, but as a knight, anything is possible. The boy is motivated to read because he sees himself in the story. The story is engaging his imagination. Perhaps he needs to see himself as the hero in the story because of something happening in his own life. By imagining himself in the world of the story, he is being transported through literature. The story allows him to see himself in a new and exciting way.